Hey everyone! I'm here to kick off our new Holidaily series! Holidaily is a lot like many projects people take up at this time of year, but instead of focusing just on the first twenty-five days of December, it documents anything holiday related from Thanksgiving to New Year's Day. My project today is from a bit earlier but it was very Christmas-y so I added it to my Holidaily notebook. 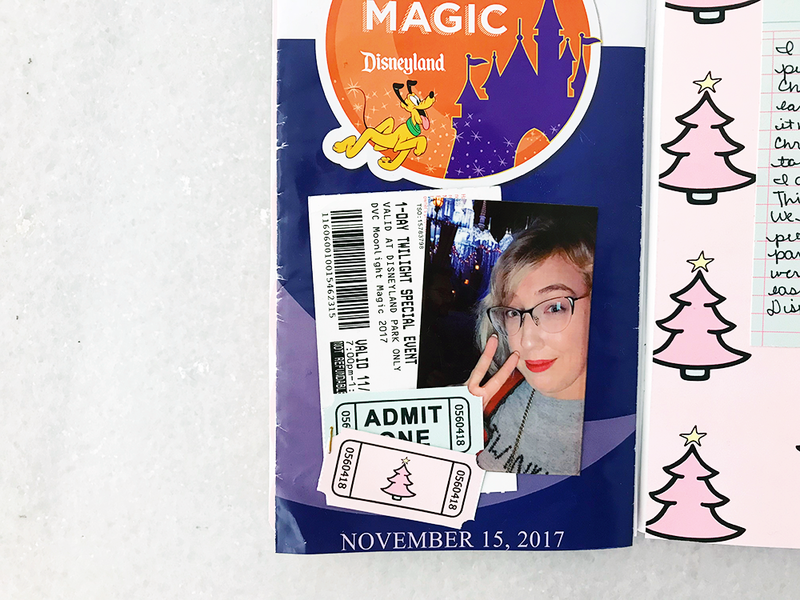 I was able to get tickets to a special event at Disneyland and since they put up their holiday decorations on the 10th, it was already festive by the day we got there! This project also shows off one of my favorite things to include from my Disney trips: maps! It's a bit difficult when you're using a TN since they're just a bit too big. I will always trim mine down or, if I can't because I'll lose goodness, I'll just let it hang off the edge. You know me, I like to keep my decoration nice and minimalist and for this project, I wanted to feature a lot of the ephemera from the actual trip. I snapped this selfie in front of the holiday castle and printed it out on my Prynt. I layered it along with our ticket to the event, adding a couple of the tickets from the cut apart sheet to the top. I adhered that onto the map front. This way, everything is front and center but doesn't make it so you can't open the map! On the right side, I featured this super cute pink tree papers, one of my favorites from the collection, along with another bit of the cut apart sheet for journaling. I kept the colors to mint and pink so as to not clash with the blue and orange on the map cover. It let there be some consistency across the project without having to bring those colors in. Thanks for checking out my page. Expect more from more of the design team as well as our guest designer. Until next time, happy crafting!